We hold expertise in the manufacture of Acme Stem Shaft supply the same in eastern & southern part of India. The entire collection is manufactured using optimum quality raw material to ensure durability of the products. - Ball and Lead screws must be lubricated to operate properly and achieve the rated life. - The TriGEL grease can be applied directly tothe screw threads near the root of the ball track. Kerb Konus Fasteners Pvt. Ltd.
We manufacture, supply and export precisely designed Acme Lead Screws. 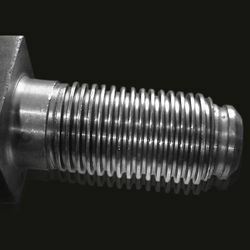 Our Acme Lead Screw are precisely designed with the help of advanced and sophisticated machines. The Acme Lead Screws are completely corrosion resistant and are very easy to install. Our Acme Lead Screws are available in two models. : Carbon steel, Alloy steel, Stainless steel, Plastic and Copper. Surface treatment: : Plain, Black, Zinc Plated(ZP), Yellow Zinc Plated (YZP)and Hot DIP Galvanizing(H. D. G. ), Dacromet, Nickel Plated, Brass Plated. Grades: : 4.8, 5.8, 8.8, 10.9, 12.9, 2, 5, 8, A307, A325. Standards: : DIN, BSW, JIS, ASME and ANSI, Non-standard, Custom Drawing. - materials: bright steel ms bar, en bar, c. I. Casting, bronze, plastic, etc. The OMATIVE Adaptive Control & Monitoring System (ACM) optimizes the roughing out and semi-finishing processes of a mould/die, as well as ensuring the absolute safety of the tool, spindle and machine tool as regards possible collision between the tool and the workpiece.